The Legal Genealogist is in Texas today, in its capital city of Austin. And yesterday I saw a link to a shirt I have got to have. I just have to have one of these. My mother, Hazel Irene Cottrell, was born in Texas in 1926. Her hometown was Midland, in West Texas, and it’s there that she spent her childhood and her teen years. She left Texas as a young adult, headed for Colorado and work as a paleontology assistant there. That’s where she met and married my German-born father. Life took her to Europe and to the east coast and the west coast and parts in between… and even once briefly again to Texas as an adult. But she didn’t stay there; the lure of her family on the east coast was too strong and it was there, in Virginia, that she spent her last years, wrapped in the love and arms of her kith and kin. Yet her heart… that was always in Texas. It was there that both of my mother’s parents were born, as well. My grandfather, Clay Rex Cottrell, was born in 1898 in Iowa Park, in Wichita County, up against the Oklahoma border. The family moved to Oklahoma when his parents separated when he was a boy, but he eloped with my grandmother back to Texas, and spent most of the next decades there, raising a passel of kids in West Texas. My grandmother, Opal Eileen Robertson, was also born in 1898, but way down in Eagle Lake, in Colorado County, not far from Houston. She spent her earliest years there, living near sugar plantations where her father was a guard for the Texas prison system, overseeing convict labor working on those plantations. She moved to Oklahoma as a girl but happily returned to Texas when she married my grandfather, and lived there until a son brought them east in 1950. Their hearts… well, their hearts were in Texas, too. Two of my great grandparents were also born in Texas. Martin Gilbert (“M.G.”) Cottrell, son of George Washington Cottrell and Martha Louisa Baker, was born in 1855 in Parker County, Texas. M.G.’s place of birth is sometimes listed as Weatherford but is more likely to have been Long Creek in the Baker Community there. He married Martha H. “Mattie” Johnson in 1874 at Parker County, and spent much of his life in Texas — first in Parker County, then Clay, then Wichita, then out and about as a traveling salesman and as a circuit-riding Baptist preacher. Though he spent the last years of his life in Lea County, New Mexico, it’s telling that he died in 1946 at the home of his sister in Hockley County, Texas, at age 90. Jasper Carlton Robertson, son of Gustavus Boone Robertson and Isabella Gentry, was born in 1871 in Lamar County, Texas. He grew up mostly in Delta County, but met and married Eula L. Baird in 1896 at Bexar County — near San Antonio. He went to work for the Texas prison system, and spent time in Colorado and, perhaps, Wharton Counties, before hearing that Oklahoma was opening up fine lands to young men with families. He moved his own small family to Oklahoma around 1902, and was one of the successful bidders in the Big Pasture land opening in 1906. He died in 1912 at Hollister, Tillman County, Oklahoma, at age 40. Many more members of my family called Texas home at one time or another in their lives… these are just those in my direct line who were Texan-born. Holy cow! You can’t get much further apart and still be in the same state than that! It’s what — more than 800 miles from one side of Texas to the other? BIG state!! My roots run deep in Texas too. And I learned early in life that you can take the boy out of Texas, but you can’t take Texas out of the boy. The Vaughans, The Malones and the Andersons helped open up Texas and most were farmers with a few businessmen, a Texas Ranger and a distant cousin lost at the Alamo to cement their legacy here. I have a cousin who was a Texas Ranger captain, another who was a county sheriff… and then the bad boys to balance the scales! Well, now that you have publicly admitted that you qualify for the Daughters of the Republic of Texas, you will no doubt have multiple invitations today to join a chapter. I trust you will remember that your Cottrell cousin is first in line and has already extended you an invitation to join the Peter James Bailey Chapter of Irving, TX. One of these years I may actually have time to think about this… if you folks don’t wash away in all that rain!!! While you’re in Texas (or at some point), I’d be curious to know about Texas laws regarding people’s changes of name. In brief, we’ve discovered that the Outagamie County, WI product who we think was my great-grandfather (we know from DNA that it was at least someone in his extended family, but he’s our best candidate) moved to San Antonio around 1894 and changed his name from Mory to Fuller. He married in 1895 and appears to have remained in San Antonio for the rest of his life. The documents we’ve uncovered indicate that he wasn’t hiding from his Wisconsin relatives, but we wonder if he was trying to prevent my great-grandmother and her mother from tracking him down. They lived in Minnesota and would have been unlikely to learn of a name change in San Antonio. I’m guessing that a name change would have had to be published in the newspaper of record even then. Right? And would he have had to change the name legally in those days (he became a solid citizen, not a vagabond)? You’ll want to look at the statutes for the time and place but, in general, legal name changes through a court were not required in most of the United States until very recent times. As long as you weren’t out to defraud your creditors, you could call yourself anything you wanted to without needing court approval. I doubt I was even walking yet my first trip to Texas, Stan, so not the same sort of culture shock! Haha, I love that shirt! I need it desperately! Where did you find it? 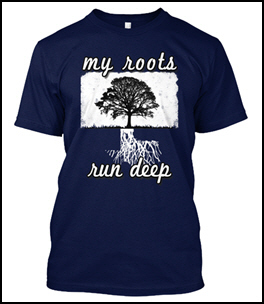 The link is at http://teespring.com/my-roots-run-texas-deep. The website says it’s not available but you can click on the “I still want one” button and order. It says if they get more orders the shirts will be available!